God sprinkled an extra dose of “male-adventure dust” on eleven-year-old Daniel. He is enamored with guns, war history, modern warfare and all things aircraft and aerospace related. His favorite shows? Why the History and Military Channel of course! Growing up with two sisters, this is all new to me as we were the Barbie, let’s-play-office, create-a- talent-show or bake something types. This Sunday Daniel, my father and Uncle Dave were shooting cans and practicing aim in the backyard. After raising three daughters it appears that nothing delights my dad like having three grandsons and three sons-in-law, including Daniel who reeks of masculinity. My dad’s love and joy for these surrounding males is only rivaled by a straight flush in three-card poker at the Chumash Casino (I’m kidding). Before I go on you must note that Dove Season started on September 1. I know this because my father went dove hunting on opening day every year when I was a little girl.Well, pity the poor dove that landed 40 feet away to drink from the Jacuzzi, or take a bath, or do whatever those darling grey birds do around water. My gung ho father challenged Daniel to shoot the dove, knowing that he could never ever hit it that far away. Unfortunately, for the dove, he was wrong! Testosterone filled excitement ensued along with a detailed explanation on how to clean dove. Gross. 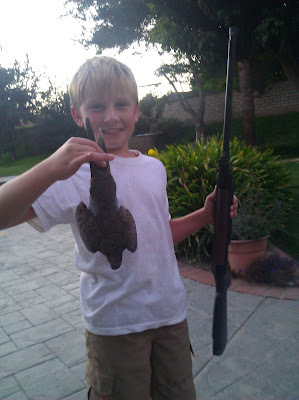 Now, I don’t think it can be said that Daniel became a man after shooting his first dove. It seems that one must hunt something big like a buck, elk, or bear to earn that status. However, the first time a boy “hunts” and is successful (aluminum cans not included) I’d like to think he has earned a great story to share with his buddies, and maybe a little chest hair too.